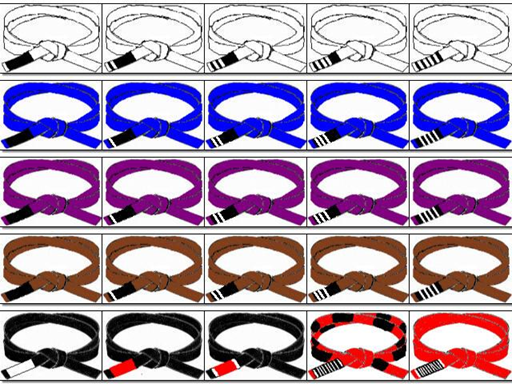 The Brazilian Jiu-Jitsu Belt System is a far stricter than in most other martial arts. It can take upwards of 10 years to achieve the black belt. As there are only a few belts, you will spend a long time on each one. Also, your progress will not be linear. You will spend weeks or months on plateaus before being rewarded with a jump in ability. Sometimes it will actually seem as if you are getting worse instead of better. But the plateau is actually your friend and is itself an indicator of progress. It is those who have the mental strength to keep going when they find themselves on a plateau that break through to a higher level of ability. Several years ago, black belt Roy Harris wrote a good article detailing what was expected at each belt. I have extrapolated on this and provided a breakdown of what I expect from my students at each belt. No matter what, remember to enjoy the process. Don’t be too focused on the achieving the next belt or winning competitions etc. As a white belt, your goal is to create a frame of reference for your future learning. You need to learn what you don’t know. Think of BJJ as a jigsaw puzzle that you are trying to figure out. The white-belt is where you create the ‘outline’ of the picture, before filling in the centre. Using flow diagrams will help greatly. Learning to relax is an absolutely essential skill and white belt is the best time to acquire it. I cannot overstate how important this is. The only way you will be able to do this by learning to control your ego. Remember: nothing is expected of you at this stage. Try to focus your energy on the experience instead of ‘winning’ or ‘losing’. 1. Learn the names of each of the main positions and acquire a basic familiarity with each of them. e.g. be able to identify the guard position. 2. Learn to control your ego by accepting that you will be beaten by the more advanced students. If you are big and naturally athletic this will be even more important for you. 3. Get used to the ‘feeling’ of jiu-jitsu. Pay attention to how your body moves on the ground and the way a resisting opponent uses his strength and weight. 4. Choose one technique and try to master it. Hearing that made a deep impression on me. From that point on I focused almost exclusively on my defence. I will not give any of my students a blue belt unless they have a decent defence. I want to see them able to escape from all the major positions with relative ease. Secondly, You will need to learn to pass the guard. To me, passing the guard is the most difficult aspect of jiu-jitsu. You will spend a great deal of time in your opponents’ guards, so you should become very proficient at dealing with the position. 1. Have two solid escapes from Mount, Back Mount and Side Mount. 2. Master two techniques for passing the guard. 3. Compete in at least one Competition. This is the belt of movement and momentum. You will learn how to use the momentum of your own weight as well as that of your opponent to achieve your movement objectives. A lot of the ‘wasted movement’ that exemplified your game at the previous belts will be shaved away. 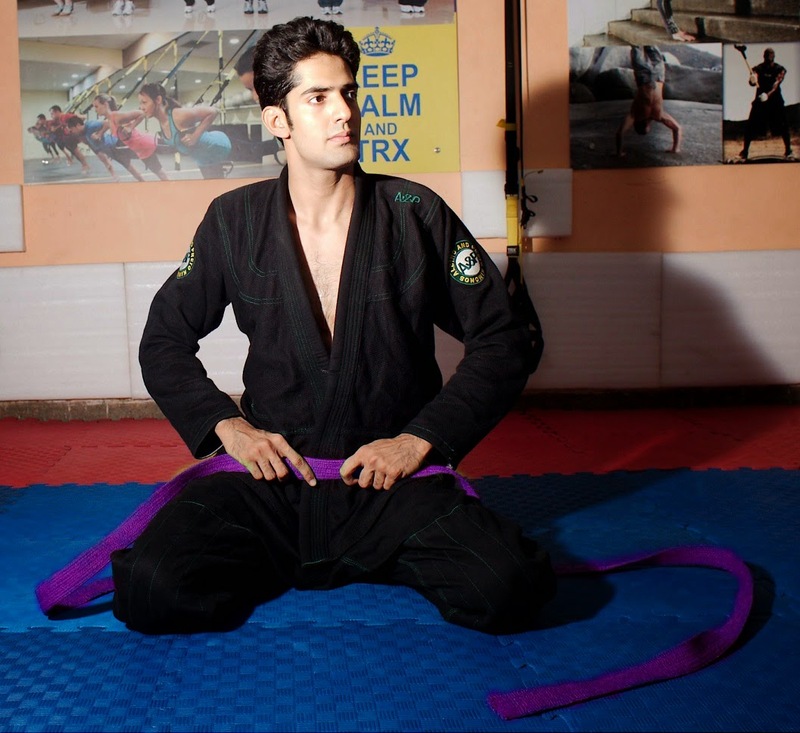 Purple belt is also where you will finish laying the foundation of your entire game. As mentioned earlier, I suggest that this foundation be a solid defence. You should try to spend your time at this belt focusing on the weakest aspects of your jiu-jitsu – these are known as the ‘holes in your game’. A good purple belt also has a great offence and is dangerous from any position. This is also where the jiu-jitsoka should start learning to attack using combinations of techniques. As a purple belt your guard should be very effective. You should have a familiarity with all the different guards and specialize in at least one, preferably two. 1. Have 3 combination attacks from guard position. 2. Have 3 submissions from Side Mount, Mount and Back Mount. 3. Become familiar with all the variants of the Guard position. Although not yet a master of the art there will be very, very few positions or situations a brown belt is unfamiliar with. By now you will have your own style and will probably be recognized as a top-player, bottom-player, all-rounder etc. A decent brown belt is able to teach the art to others. In fact, this is when many BJJ players realize that they have a passion for teaching and decide to embark on coaching as a career path. He also understands that teaching is a good way to consolidate the knowledge he has gained up to this point. A brown belt is evil from the top positions. In mount and side mount he knows how to use his bodyweight and makes sure the person on the bottom feels every ounce of it. He will pass the guard at even the narrowest window of opportunity. His balance will make him very difficult to sweep. At this stage, he will also have developed counters to almost all the most commonly encountered techniques. This means he will be one or two steps ahead of lower-level opponents. He will also have several ‘signature’ techniques. These are moves which he has mastered and can get to work on almost anybody. 2. Perfect your weight distribution and balance in the top positions. 3. Work on counters to common attacks. The jiu-jitsu black belt is truly a master grappler. He is a person who knows far more about his body, his mind and his limitations than the average individual. He is humble, friendly and respectful of others. He is a highly efficient and dangerous martial artist but uses his skills and abilities to defend and help those less capable than him. The black belt starts to look at everything with a fresh set of eyes. He can take the most basic movement that he has practised thousands of times and realize that he is still able to refine it. A black belt moves with an economy of motion and grace. More importantly, he also knows when to move and when not to move. His jiu-jitsu is not only effective it also looks good.